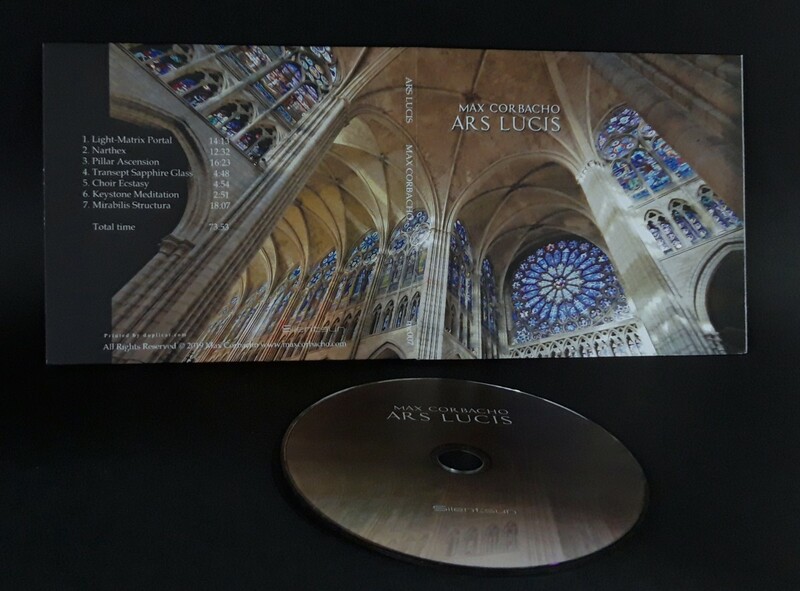 Ars Lucis is often referred to as one of Max Corbacho’s finest albums and a true classic of ambient music. During these 10 years since its release, it has not stopped attracting more and more listeners. Often this music has been described as being in a galactic cathedral, majestic, atmospheric, spacial, monumental, graceful and magnificent. Now after being out of stock for a long time, Ars Lucis is again available on CD. 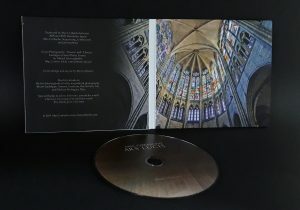 This reissue comes in a new plastic-free Digisleeve keeping all the original audio intact, giving the opportunity to those who have recently discovered this album to get it on CD, and also to those who already have it but want to have a version with better artwork and more elegant packaging. The bonus track “Beyond Vaults” is included in the digital download (not on the CD). This piece was not included in the album for exceeding the length time of the CD. It was created at the same time as the others on the album and retains the same atmosphere. Light and harmony could set this purely atmospheric work by Max Corbacho. Not the blinding light from outside but light filtered through high windows of colored glass, broken and transformed into multi-colored gems, transferring that which is material to That which is immaterial. Like a weightless dream, the main theme is exposed in Light-Matrix Portal, where a gentle swirl of chords leads us, as in a Gothic doorway, in a magnificent space. The main theme remains on all the pieces in a subtle way, spreading mystical, delicate scents through labyrinthine passages ascending and spiraling to the vaults. Max presents the album’s flow through different sonic zones sequentially, as if we proceeded on walking meditation in a 13th-century cathedral. Vaporous textures unfurl to fill the chamber, then undulate to bring these attenuated layers into endearing contact with each other, merging to produce a delicate density that retains a demonstrative softness. All of the auxiliary electronics share this mellow touch. Twinkling with crystalline beauty, the tones reverberate with an airy character as if the sounds themselves can convey an airborne buoyancy. While these compositions embody a discriminating celestial flair, their expansive presence is imbued with a divine elegance that excellently captures the awe inspired by viewing cathedral architecture. These lucid creations divulge majestic splendor with each tenuous passage. Beatless, minimal ambient air. As if painting with the sonic equivalent of light, Max Corbacho establishes a deep, resonant, anticipatory expanse and fills it with shafts and shards of shifting colour and density. Broad beams and hazes of tone drift in unhurried solemnity, rising heavenward in weightless clouds or massing gradually into translucent omnipresence. The ponderous large-scale undulations of these evolving, spacious atmospheres are illuminated with lustrous glimmers, sparkles and radiances of a more fleeting nature. Ripples and fluctuations that pass through the weight of the air with faster motion. There is a reverential dignity to this music that beautifully captures something of the architecture and luminance of the cover imagery; this graceful lustre, this art of light. In total almost seventy four minutes of sublime melody-free magnificence. It sounds like a church between the worlds, a liminal space of stained glass and orderly pews. It sounds like walking into the delivery room as you’re being born. It sounds like the menu music for some futuristic operating system. It sounds like walking into some blank place that hasn’t been created yet, feeling like a speck of dust on a white canvas. And yes, it sort of sounds like space. But it sounds like so much more than that. If Goethe called architecture frozen music, it seems that Max Corbacho succeeded in his latest recording to release music from stone without losing the sacred geometries. ARS LUCIS delivers a perfect flow of space, sound and silence manifested in seven tracks of pure meditative harmonies. Every piece of music shine with aural beauty from a quiet inner centre opening to the infinite. Delicate resonances are melting into an uncognoscible light, calling the senses to perceive beyond any form, infusing the mind with spaciousness that permeats and pervades an entire world of subtle experiences. Listening effortlessly, finally you will feel your entire being as a unique stained glass window crossed by abundant luminous waves projecting a radiant display of color on distant ethereal planes. Max Corbacho returns with a long-form disc of his signature lighter-than-air drifts in Ars Lucis. Corbacho’s constructs float in higher registers, airy choral sounds occasionally lifted by a bass rumble updraft. This is, as the cover art suggests, a soundtrack for watching light filter through stained glass in a sacred space. 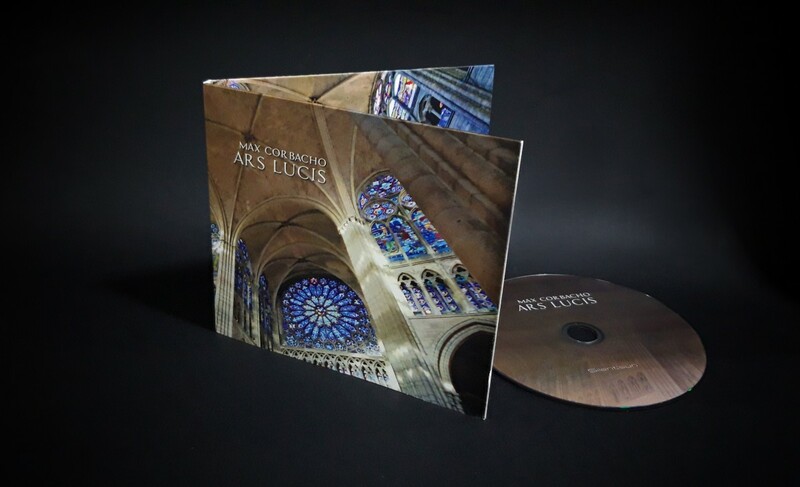 After the gentle ambience of his 2008-release “BreathStream”, Max Corbacho takes us to ambient heaven with his release “Ars Lucis”. Those familiar with his work know what he’s capable of, spending lots of time in his studio sculpturing and harmonizing a continuous flow of expansive textures, which now have ended up in deep, captivating meditative realms. 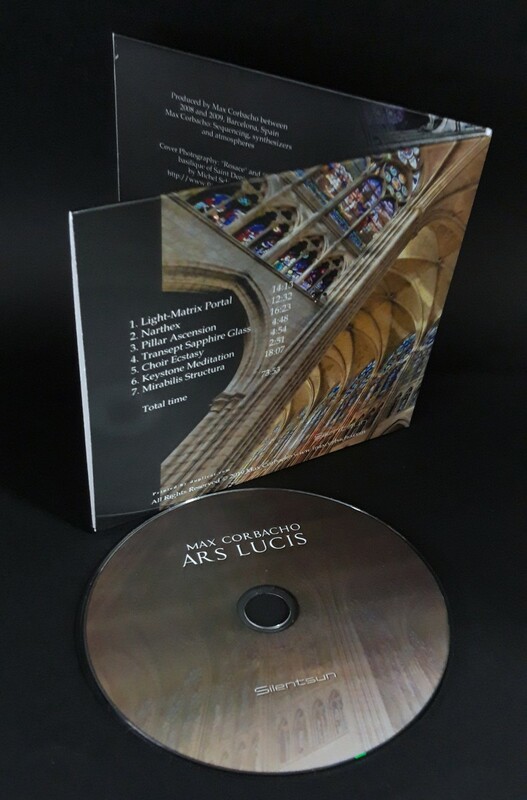 The almost 74–minute outcome on “Ars Lucis” is velvet, celestial music that drift along in multiple colours and through subsequent different sonic zones around its beautiful core. 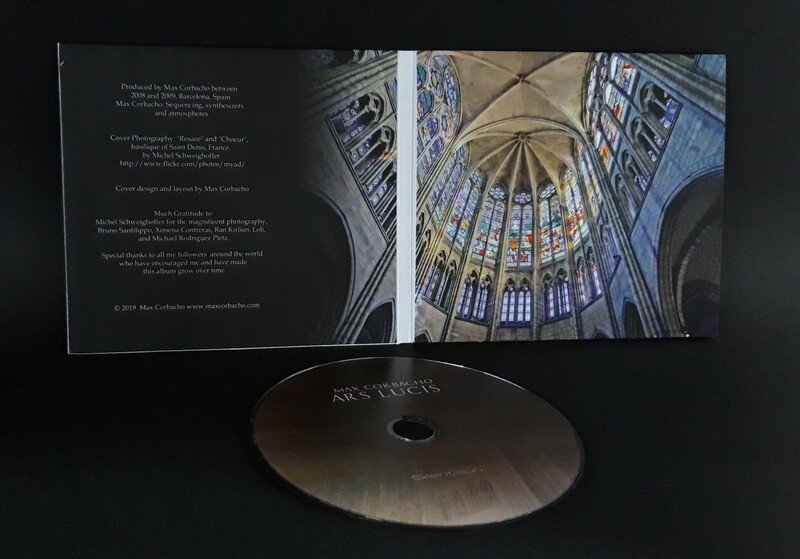 This grand and spacious music reaches for expansive worlds of splendour, of which the mood is already set by the great photography of a French cathedral on the cd-cover. There’s something incredibly ethereal about this album. Max Corbacho is brilliant at evoking reverence, space and a feeling of… well… the cosmos. Much of his work seems, bright, icy & celestial. Ars Lucis has a vast sense of space within it. Inspired by cathedrals and the way light pours in through coloured windows, Corbacho spaces the high bell-like textures and low rumbling music far apart from one another. It is atmospheric and reverent music at its best.